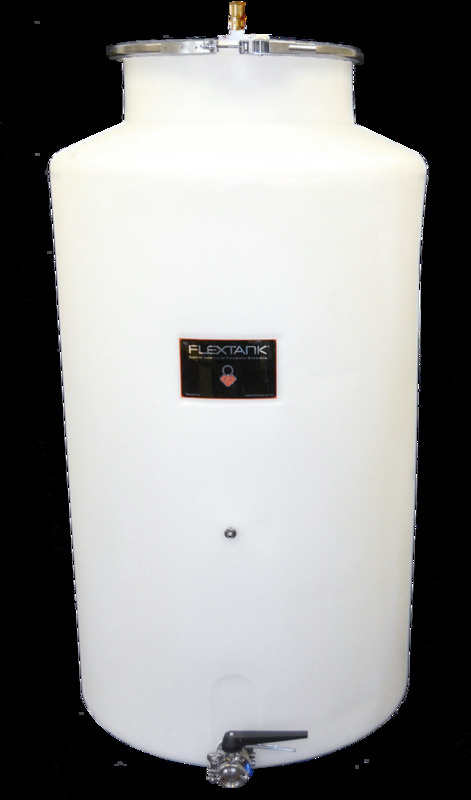 Self supporting cylindrical tank offers good value in dollars per gallon terms. Excellent access through the 19 in. diameter clamp lid for cleaning and oak adjunct management. May be mounted on a pallet for mobility with a pallet jack or fork truck. Self supporting cylindrical tank offers best value in dollars per gallon terms. Excellent access through the 19 in. diameter clamp lid for cleaning and oak adjunct management. May be mounted on a pallet for mobility with a pallet jack or fork truck. Sized for low ceilinged areas including caves.Accessories may be purchased separately. When no drain valve is fitted the empty tanks are light enough to be laid down for cleaning by an average sized person. Cleaning with a pressure washer uses minimal water and the inverted tank drains completely. All tanks include the molded-in inserts shown for drain valve flange attachment either at time of purchase or as a field retrofit. All tanks include the molded in inserts shown for drain valve flange attachment either at time of purchase or as a field retrofit.